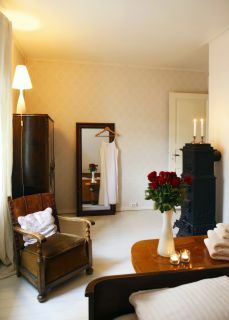 elleVilla is a cute and comfortable little B&B situated in beautiful surroundings close to the waterfront in LARVIK. you can get here by railway from around the country, airplane from anywhere in the world or by sailboat from denmark and sweden. fell in love with photos of the house, called the owner who could tell me it was not yet sold, saw the house - and the amazing MAGNOLIA tree in full blossom!!! - and bought the house before the band got on stage. I got all the permissions I needed (thank you, LARVIK and great neighbours!) - and my life has been a wonderful fairytale (with numbers of hours of fun & hard work) ever since. I have the bests guests in the world, - and they keep coming back!! elleVilla has got three nice rooms for guests, all guests share a big, delicate bathroom + extra toilet with sink (and this normally works out fine as we make a little plan for time of showering/breakfast etc. 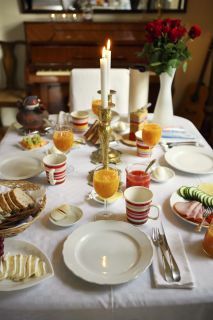 ), a good breakfast is served in livingrooms with a wonderful atmosphere. the garden is like a danish painting in the summer and people love hanging out in my grandmothers old furniture under blossoming apple trees. we serve good food and fun drinks, we play smooth, jazzy music from hidden speakers (in the blossoming trees) - and some summer nights we even serve great live music - performed by our favourite artists. larvik golf - one of the better courts in norway!! welcome to Larvik and elleVilla! !